Gurgaon : People making excuses to skip a road toll tax is not new, but crossing limits and risking someone's life for it is something that has not been heard before. "You'll stop my car? Even the police doesn't stop my car," said an Innova driver, refusing to pay the toll, to the attendant standing in front of his car, reported news agency ANI. 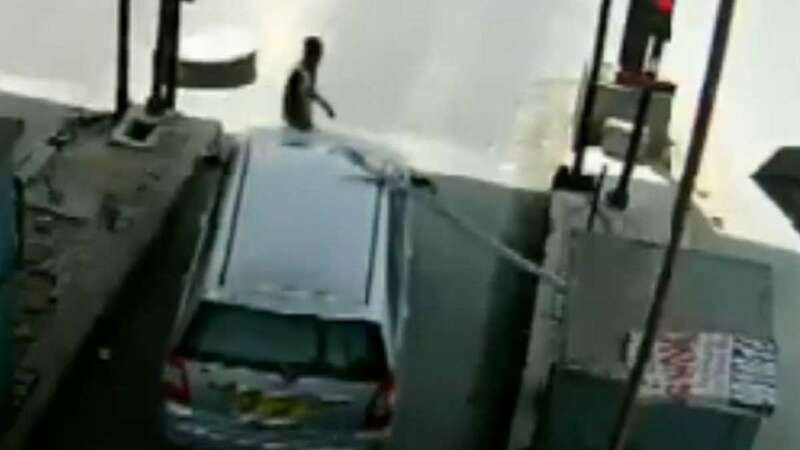 In an unimaginable incident captured on CCTV, a Innova driver was first seen arguing with the toll man and later making a run from the spot; in the process he drags tollman on the car bonnet for over 5 kms. According to a report, four men were travelling in Innova. The driver does not stop. Another angle in the same video released by news agency ANI shows the driver charging down the road, with the toll booth staff still on the bonnet. "The driver dragged me for 5-6 km on his car's bonnet on a speed of about 100 km/hour," the toll staff said. The toll staff, identified as Ashok Kumar said he held on to the car's wipers to save himself from falling. "It was an abduction. The men in the car took me to an isolated place after driving for some 7-8 km toward Manesar. They stopped at a isolated place and beat me up badly," he said in his complaint. "The owner of the car threatened me with dire consequences if I report the incident to the police," Ashok Kumar said, according to news agency IANS. Two person have been arrested in the matter, the car seen in the footage has also been seized by the police.